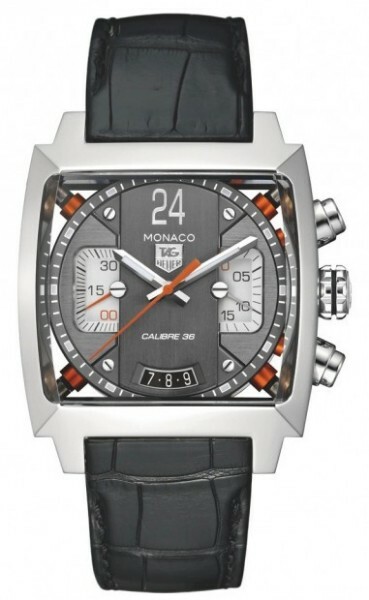 The Tag Heuer Monaco Twenty-Four Calibre 36 Chronograph Men’s Watch CAL5112.FC6298 is masculine and sporty. 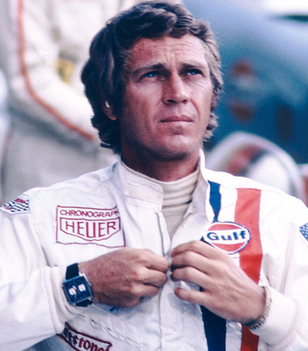 So sporty, in fact, that the Monaco line of watches was worn by actor Steve McQueen in the 1971 racing movie Le Mans. In racing, exact timing down to the second is crucial, and the Monaco watch, with its automatic chronograph, is able to time up to 12 hours with an accuracy of 1/8th of a second. That makes this watch perfect for athletes, adventurers, outdoorsmen, and, yes, even racecar drivers. Tag Heuer Monaco Twenty-Four Calibre 36 Chronograph Men’s Watch CAL5112.FC6298, with its square, push in crown and both the Monaco and Tag Heuer logos under the 24-hour marker is stylistically faithful to earlier models in the Monaco line. Like several others in the line, it has a black alligator strap. But the gray dial with the red accents, and the skeleton case back make it distinct from the rest. The case and bezel are both made of PVD stainless steel, and the crystal is scratch resistant sapphire. Adding to the athletic functionality of the watch, it is waterproof to 100 meters. The Monaco Twenty-Four Calibre watch sells for anywhere from $9,568 up to a list price of $13,700. 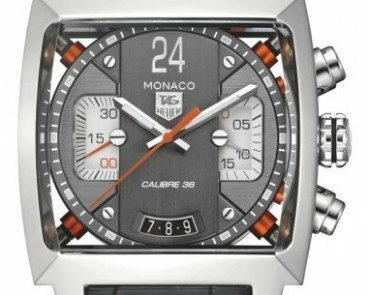 Other models in the Monaco line, such as the Tag Heuer Monaco Calibre 12 Men’s Watch CAW2111.FC6183 at $3,911, run for much less despite their comparable features. However, as opposed to the bright blue face of the Calibre 12, the Twenty-Four Calibre watch, with just its hints of red, has a more elegant and subtle, less flashy appearance, more suited to every day wear. Tag Heuer Monaco Twenty-Four Calibre 36 Chronograph Men’s Watch CAL5112.FC6298is truly representative of the quality luxury that Tag Heuer is known for. That fact makes this watch a perfect gift for any sportsman or athlete, who still wants a touch of class and style. The Monaco Twenty-Four Calibre watch is stylish and sporty, designed for comfort and wearability. Steve McQueen wearing Tag Heuer Monaco in "Le Mans"
This classically designed timepiece is perfect for any occasion, from a weekend of adventure to a night out on the town, and anywhere in between.